Applications are invited in the Prescribed Form from Eligible Candidates From Filling Up. the jobs will we following up Govt Jobs . Application are Invited from the national Citizen. The recruitment for the Indian Navy recruitment . 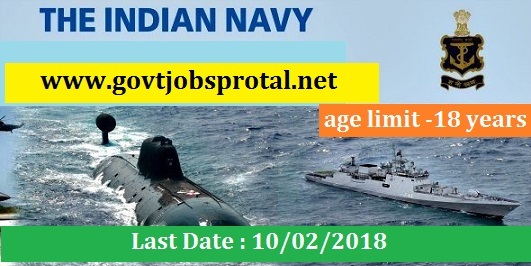 Total Vacancies -38 post and pay Scale of this jobs Sub Lieutenant -56100-110700/-& Lieutenant -61300- 120900/- Lieutenant CDR Lt Cdr -69400 -136900/- per month . Application are invited From unmarried Eligible male/Female Candidates for grant of short service Commission SSC in Education Brach and Unmarried eligible male Candidates for Grant of Permanent Commission Pc in Executive Branch Logistics Cadre in the Indian Navy . Pay Scale : 69400 & 56100 per month. Age Limit : 18 Years. 1).M.sc( Maths /Physics /Nuclear Physics /with maths in B.sc . b).The candidates may be appointed at anywhere in the state. (You will get more information in News paper dated on 20/01/.2018 Page no.(11).) Visit the official website for more information.